Interview: Sir Bruce Forsyth CBE | How Did They Do It? 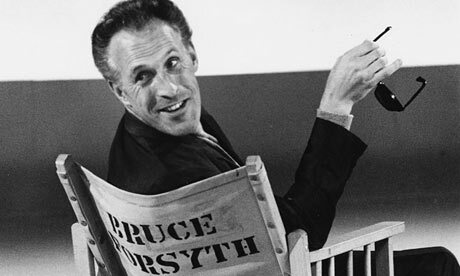 During the 1970s and 80s, Sir Bruce was a permanent fixture on British evening TV, presenting The Generation Game, Play Your Cards Right, The Price is Right and You Bet! After a period of relative obscurity, Sir Bruce’s career was rejuvenated in 2003 following an appearance on the topical quiz show, Have I Got News For You?. “Nice to see you, to see you nice” was voted the most popular catchphrase in the UK in 2007. In 2013, the Guinness World Records recognised him as the “male TV entertainer with the longest career”. This is an abridged version of a series of 30 interviews made for a book. Thinking back to when you were just starting out, as Boy Bruce the Mighty Atom, what did you have to do to get yourself noticed as a young performer in the 1940s and 50s? I started doing amateur shows during the war because my mother and father ran a variety company and in those days we could leave school at 14, so I left at 14 and went into show business. Back then you looked in The Stage or The Performer, which were theatrical magazines with work listings and you would get work through them. My first ever professional date was at the Theatre Royal in Bilston, which in those days was in an area called the Black Country because of all the mines. It was a dreadful show really, I mean really awful, but the producers managed to persuade my parents to put £25 into the kitty so we could all go ahead with this awful show. At the end of the week, we got paid depending on how big our billing was and I got paid in old money, 13 and fourpence for the week. I had to wire home to my mother and father to give me money for the train home which cost 35 shillings, and on top of that, I had to pay another 30 shillings for my digs, which would be about 65p today. It’s a million miles away from where you ended up. Exactly, and my mother and father said to me, “do you still want to be in show business?” and I said “oh yes I’m going to love travelling to different towns and doing different shows”. My main ambition in those days, and it was the ambition of every variety artist, was to work the number one theatres in the country, which were the Moss Empires. They were a top circuit of theatres and after that there was the Stole circuit, and then B. J. Butterworth’s Butterworth theatres and then you had the real rat holes where you didn’t even have a stage door-keeper, those were the dregs of theatre in this country. So there was first rate, second rate, third rate and fourth rate and I worked them all!! You also managed to do a number of different acts during this early period. I was a song-and-danceman and I played in a number of double acts. With the American Red Cross I did another double act which was a wonderful job to do – we both played the piano accordion, my partner was a great drummer and of course I sang and tap-danced, entertaining American troops in the run up to D-Day. When the Red Cross finished I went back to trying to get into variety theatres. You kept going, you had many weeks out but then you had many weeks in. Then I did a stint where I was in Jack Jackson’s stage band and when that broke up they went to the number two theatres. Then I went to the Windmill Theatre and became a juvenile lead, a song-and-dance man again. Did you ever contemplate packing it in? Oh yes I certainly did! After I first went to the Windmill I got my calling up papers so I had to go into the RAF for two and a half years, after which I came back and did another stint at the Windmill and met my then wife, Penny Calvert. We tried getting jobs everywhere but finding a job as a dancing-singing act was difficult, you were either a dancing act or a singing act, you couldn’t be both. We even went to India in an attempt to break out as a song-and-dance couple. We worked in a hotel in Karachi and a few others on the coast of India. When I came back I started wanting to do a single act and that was a big challenge because I didn’t quite know how that would be accepted. I did quite well at that but I was always what they called “second spot comic” which means it was your job to go on after the dancing act. You had to try to warm the audience up which was a thankless job and I did it for three or four years and I did say that if I had to do that for the rest of my life in show business I would get out but just before the five years was up I got the job at the Palladium which changed everything. The particular path you took to stardom, working the variety circuit for 16 years, is rare among most of today’s top television performers. Do you think that has given you characteristics or ideals that have helped you during your television career? Yes, I took me 16 years from the age of 14 to when I was 30, when I got the job at the London Palladium, that was the biggest job you could get in the country. I never begrudged those 16 years because I learnt so much in that time. Because it had taken such a long time, I appreciated it, whereas today, somebody can become a big star overnight and that is much more difficult to deal with. I wouldn’t like that to have happened to me, I would rather have had all the experience I had than be suddenly thrown into another world that I knew nothing about. Thinking about the experience of being on stage, you’ve talked about the highs from being on stage and performing to a large crowd, most recently at Glastonbury, but also at live performances in general. A lot of comedians in particular talk about having highs on stage but then they are often accompanied by quite severe lows off stage. Do you experience those highs and lows? Yes show business is all about being high one minute and low the next. Even before that 16 years was up I would go to auditions and I wouldn’t know whether they liked me or not and you never heard back. It was all part of the build up of getting somewhere in the business. You mentioned Glastonbury, that was the last thing in the world I thought I would ever do and the Albert Hall is that last place I thought I would ever appear. If it had been a disaster I could have said “it was a venue too far” and at my age you can make a big mistake and no one will think anything of it so long as you are honest! Glastonbury was the biggest reception I have ever received in my 70 years in show business, I have never had such a reception, with people chanting “Brucie! Brucie! Brucie!” before I even went on. What frightened me was so many young people there, it was an audience of people in their 20s, 30s and 40s, hardly any 50s or 60s, certainly no old people like me. It was a young, young crowd, the people who criticise me in the newspapers for being old hat, using old material should have been there. If an audience of that age group can accept me then how can I be old hat? I am not a stand-up comedian, I’m an all-round entertainer. I sing, I dance, I play the piano, I do impressions and involve the audience for over two hours. It might not be stand-up but it doesn’t mean it’s dated. A lot of your performances are ad-lib, particularly on Strictly and the like, within that, would you say there is a Sir Bruce formula to speak of? Yes in my one man show there is a lot of places where it’s ad-lib as well. I get four people out of the audience and have fun with them which is a 15-minute bit. That’s all ad-lib because I don’t know who I’m going to get, or what I’m going to say to them. You are well known for having a series of mental exercises such as your Tibetan stretches, and some of the other techniques you use for keeping fit and getting in the right frame of mind. How did you come across these rituals and how do they help you? I start in bed by doing different stretches and that takes me 10-15 minutes and then I get up and I do all my exercises, I do a lot of stretches and semi-yoga things. The trouble with me is I hear about a different exercise and I put it into my routine so the way I am going on I could be doing all these exercises until lunchtime and not even have breakfast! They have stood me in good stead and I finish by doing 25 twirls on the spot, twirling almost like a ballet dancer. If anybody normally tries to do that even four times they would fall flat on their face but I do it 25 times and I finish up steady as a rock. It’s supposed to be very good for the metabolism and it certainly helps you wake up. Are you are creature of habit in other aspects of your life? Yes, I’m a very habitual person. I have a diet of sorts, although it’s not a very strict diet, I do the hay diet where you don’t eat potatoes, rice or bread with a meal. John Mills was a great man for that and he said a couple of times that he thought it saved his life. I do love potatoes on a Sunday but otherwise I keep all potatoes off my meals, it will be fish and meat with vegetables. I drink a lot of water, I have some fruit every day, so it’s all the things that people have been telling us to do for years but who does them? I don’t think anyone does them other than me. You began at home, tearing up the carpet so you could dance on your parent’s floorboards, and now you’re one of Britain’s best loved performers and that has also come with a dramatic improvement in your living standards to put it one way. When you reflect, as you must do, on your career and the journey you have been on, what sort of things come to mind. What has been so wonderful about my career is that I have been on primetime television now for 54 years, that’s going back to the Palladium in 1958, up to Strictly in 2013. Every decade has more-or-less grown up with me, every ten years a new set of young children have grown up with me over that 70 years and they’re still doing that. Children of 5, 6, 7 are growing up with Strictly and old grandad Bruce is on the TV on a Saturday night so that has been very gratifying. But I also consider myself to be very lucky that in all that time I have done the kind of shows that a family audience has enjoyed watching and that has just mounted up over the years. When I went to Glastonbury I was thinking “all these people who are 20 or 30 years old were seeing me 20 years ago when they were little children”. That’s something I am very grateful for. Something I learnt very early on when I started doing a single act is to be yourself. Be absolutely natural, walk on a stage the same way you are meeting someone in the street for the first time, or at a party, just be absolutely yourself. When anybody writes me letters asking for advice in show business it’s always the best advice I can give: be yourself, don’t try to be anybody else. When I first started in the business doing a single act a great big impresario said to my agent “he talks too high, his voice should be lower, and he should talk in a pseudo-American accent”. Sounding American was the flavour of the year. Big American comedians came to the Palladium and they were so good that people tried to copy them and talk in a pseudo-American voice. My agent told me to get a tape recorder and practice, and I tried and I thought, “how can I do this? This isn’t me, I just want to be me”. I did a week at the Empress Brixton, which was one of the largest variety theatres in London at the time, it was built like a cinema so it had a very cold atmosphere and it was very, very difficult to work there. I did a week there and I broke my heart because it was so bad and the reaction was so awful, I died every performance, I was so embarrassed I wouldn’t even get a cup of tea in the green room. I stayed in my dressing room from when I got there to when I left it was so awful. The week after I did a week in -a very intimate old-fashioned theatre, the City Varieties, Leeds. I did exactly the same act as I’d done the week before and it went over wonderfully, but that’s show business.